Have you ever bought all the ingredients for a recipe only to find that you don't have the right pan? This has happened to me on several occasions. Well Emeril's new book: Sizzling Skillets and Other One Pot Wonders puts an end to this type of kitchen dilemma. Each chapter includes recipes that focus on a different piece of cookware; so you know exactly what's needed before you get started. There's a section on woks, dutch ovens, slow cookers, casseroles, skillets and big pots. It's definitely a different way to utilize a cookbook, and might take some time getting used to, but it is really functional. I'll admit there's not much I don't like about this book...except maybe that there aren't any dessert recipes...but it's not that kind of cookbook. This book focuses on meals cooked in just one pot and includes over a 100 recipes most with color photos. If you've been following my blog you know that this is the start of week two of the Emeril One Pot Blogger Cooking Party sponsored by The Secret Ingredient Blog. You also know by now that I am limited to how many full recipes I can share; but that there are no limits to the amount of recipes I can temp you with. 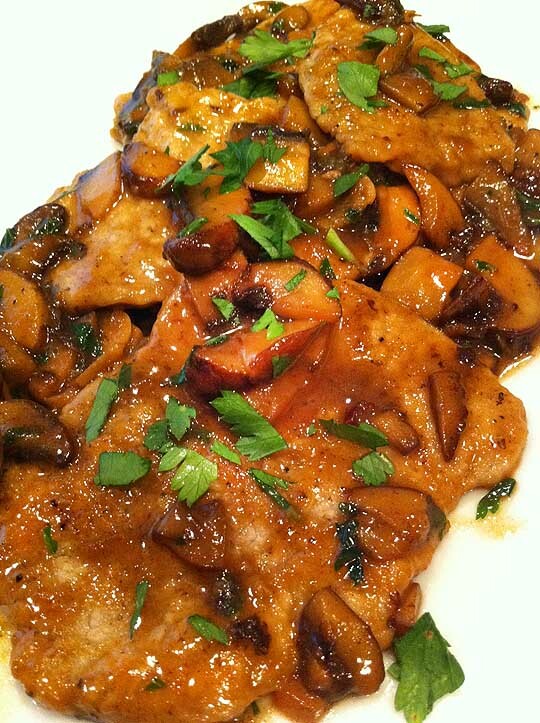 This Veal Marsala is one of my temptations. Thin slices of veal dredged in flour and fried in butter and Marsala wine. Topped with mushrooms it was very yummy and easy to make. And now for the moment you've all been waiting for. The winner of Emeril's new cookbook, picked by random number generator is: Janet of the blog LaDue & Crew. Congratulations to Janet and thanks to everyone that participated. There will be another exciting giveaway coming up later in the week. Check back often to see how you can be a winner. That's awesome!! I'm so excited, thank you!! What a great way to greet a Monday ;) I can't wait to try it out! This looks great--I think this one is also on my list. Looks great, except for the fact that I'm not a mushroom fan! I'll bet this would make a great chicken marsala, too. Oh yum, I want to try this recipe as well! Looks divine!